" Since Sunday, we've transported 15 cubic meters of mud and garbage"
Central Jakarta Water Resources Sub-dept. officers are dredging the mud and garbage from the water channel of Jalan KH Mas Mansyur, Tanah Abang. 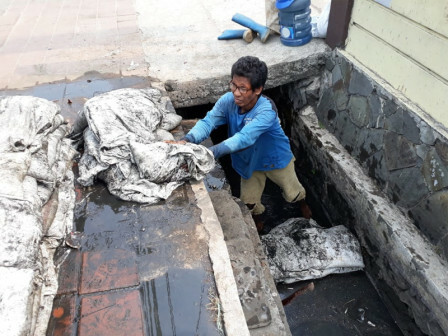 "Since Sunday, we've transported 15 cubic meters of mud and garbage," expressed Junjung, Executing Unit Head of Tanah Abang Sub-district Water Resources, Tuesday (8/28). According to him, the channel is strewn by mud up to 60-70 centimeters thus it cannot accommodate water in large quantities. "To do it, we have sent 15 officers to the field. After the mud is transported, we will dispose the m to Ancol, North Jakarta," he said.